There must be employees of these stores who have figured this out as well. I can’t imagine working for Best Buy and being told to toss this stuff in the dumpster without realizing I could make a few bucks off it on Craigslist or eBay. I’m amazed these stores haven’t figured out that they can sell this stuff rather than send it to the landfill. It’s shameful that Walmart and other big boxes are now using huge compactors to “reduce” the amount sent to the landfill. Compact, recycle, or compost the actual trash, and then figure out a way to sell those bikes or donate them to a worthy cause. It’s just lazy. How many people will read this and immediately head for the back of the nearest strip mall or big box? $600,000 a year? Um, really? The accompanying photo is priceless. Glancing in the corner behind the bathroom door, I realized: what a great place for a hook! Why didn’t we think of that before? I’d suggested that we try one of those over-the-door 3-hook jobs on the door itself, but I hate those things. They’re ugly, they’re an obvious stop-gap, they usually bang against the door, and they put stress on the door and hinges when you load them up with things like wet towels. But we happen to have one that we’re not using and it seemed like an adequate temporary solution while my dad and stepmother were in town for Thanksgiving. Fortunately, when we actually tried it, the door wouldn’t shut. Of course, I’ve also considered screwing a hook into the door itself, but it’s managed to survive that indignity for close to a century and I just can’t allow it on my watch. It’s a nice door. But the wall hadn’t occurred to me. The space is 14 inches wide, plenty of room, and the door would still open fully. Plus, a hook there would balance the one I installed on the other side of the built-in linen cabinet. Brilliant. Now, home improvement and design magazines always pitch the idea of the bathroom “spa” or “getaway” or “oasis,” words that imply the rest of your home is a desert wasteland through which you must crawl, parched and sunburned, in order to reach paradise so that you can pee or brush your teeth. I suppose this is because many bathroom activities are solitary and, for many people, it is truly an escape. But our bathroom was remodeled in the late 70s or early 80s. The original white porcelain hex tile remains on the floor, and there’s the built-in which holds a lot of stuff, but everything else came later: the beige-ish wall tile, the beige-ish double-layered wallpaper, the beige-ish granite-topped vanity, the beige-ish pickled finish applied to the woodwork, the ornately-gilded-yet-still-beige-ish mirrored medicine cabinet. I mention all this because we plan to someday renovate the bathroom, and I therefore want to spend as little time and money on it as possible. Any improvement is temporary. And while our bathroom is the perfect size, it lacks the horizontal wall space that you need for multiple towel bars. There’s one hovering over the toilet, but it’s 7 feet from the tub. And there are two towel bars in the shower/tub enclosure itself, opposite the showerhead, but when there’s a towel on the upper bar, it hangs over the lower bar, and a towel on the lower bar is at risk of getting wet from the shower itself. You get the idea. My goal with most house projects is to use only what we already have. Thanks to our kitchen renovation a few years ago (and many other projects) we have a lot of tools, fasteners, materials, etc. So, I knew we had a hook that matched the one I’d installed in the bathroom several years ago, but then I remembered that I’d installed it on the back porch where it sees everyday use. If I moved it up to the bathroom, then I’d have to replace it, and we get into the land of Scope Creep. I looked around my basement shop and workbench, sorting through various knobs and handles and entirely unsuitable hooks, all of which brought back memories of past projects. Yes! I ran upstairs to the guest room closet, slid open the door, and there it was: an odd metal ornamental hook that MT had found at World Market a few years ago. We’d used it in the powder room during that project. 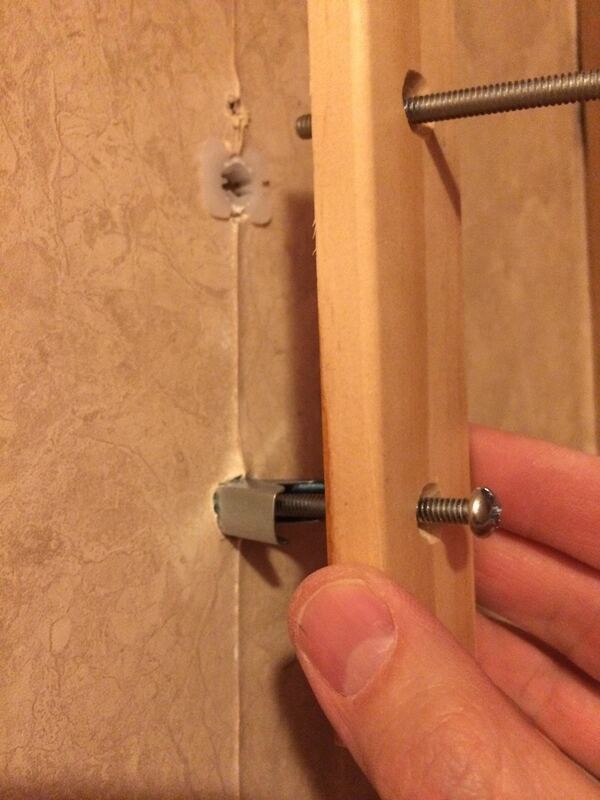 I slipped it up and off the screw from which it hung and tromped over to the bathroom. A good fit. I sought MT’s approval, which was easily obtained. Lath and plaster. There’s nothing quite like this bizarre combination: a slurry of lime plaster, horsehair, and sand spread across horizontal strips of wood. I love the simplicity. I love the sound-proofing (far better than paper-coated gypsum drywall). I even love the cracks that inevitably form. I hate attaching anything to it. If you can find a stud to screw into, you’re fine. But you only get that chance every 16 inches, and the older the house, the less reliable that becomes. My spot behind the door? No stud. I use a smallish bit, say 7/64″, and go slowly. If I’m lucky, I’ll hit the lath and feel the resistance as the bit passes through it. However, even though it’s statistically less likely, I usually manage to choose a spot in between the strips of lath and the bit just pops through. You see, that first hole was exploratory. And, no, I won’t patch it because then I’d be spending too much time & energy on this bathroom. I hit the lath this time around, so I’m good. The wood lath is very dry. It might crack, which will make the screw wiggle. Remember that the screw has to pass through 3/8″ – 1/2″ of brittle, crumbly plaster. Whenever that screw wiggles, and it probably will if you’re regularly hanging things off it, the plaster around the hole will deteriorate. The beige-ish wallpaper will not keep the plaster from crumbling. So my solution is to drill a large hole that will accept any number of different anchoring systems. My current favorite is the Toggler Snaptoggle BB Toggle Anchor with Bolts. That Amazon page has a little video that shows how it works. It works well with plaster & lath because the plastic collar helps protect and stabilize the plaster somewhat. And despite what I said above, the wallpaper provides a surface for the anchor’s collar to lock onto. As you do so, make sure the steel channel will run vertically on the other side of the lath. Then slide the collar up tight against the wall and snap off the extra plastic straps. Toggle anchor installed. Note the exploratory hole just above it. I also like this system because you can easily remove the screw without losing the anchor. I started to hang the hook, anticipating that my work would be done and I could start cleaning up. But the keyhole on the back of the hook wasn’t large enough to accommodate the head of the anchor’s bolt. I stared at the hook for awhile, then at the wall, then at the hook. I could have tried enlarging the hook’s keyhole, but I’m not that patient and I didn’t think I had the right file to do that. Instead, I came up with a truly ugly solution. I’d use a scrap of window/door stop moulding as a mounting plate for the hook. I’d attach the moulding to the wall using the anchor I just installed, and then drive a smaller screw into the moulding for the hook to hang from. However, I didn’t want the stop moulding to spin around on the wall, so I decided to install another anchor to support it. One of the best purchases I ever made was this clever countersink drill bit. I’ve had it since my first house in the mid-90s. Pre-drilling a countersink in the stop moulding. You can see that I’ve already attached the upper bolt. You have to guess at the depth of the hole as you’re drilling, but it’s easy to get the hang of. 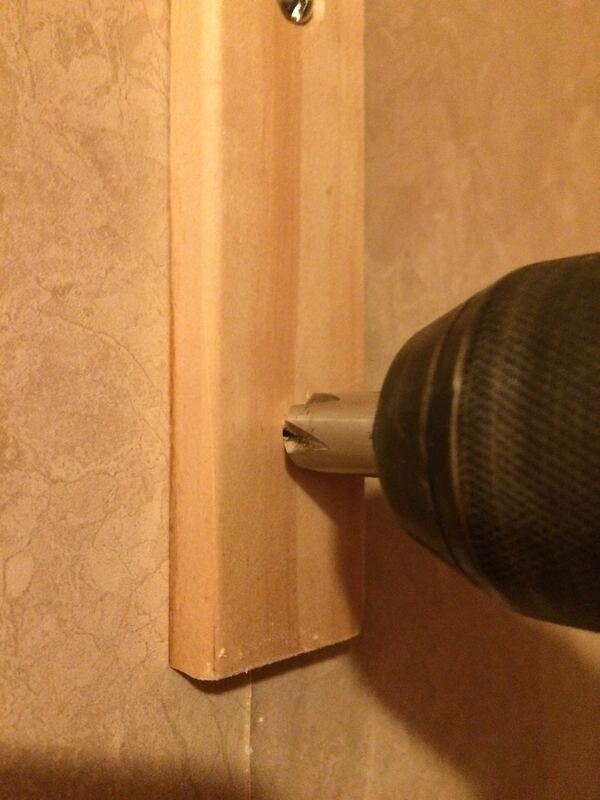 Countersinking the bolt heads allows the hook to hang flush against the moulding. 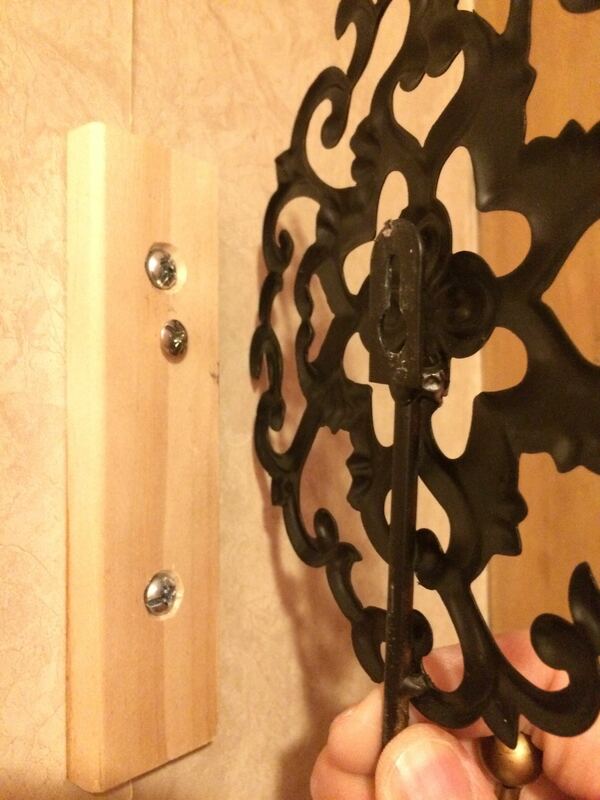 With the holes countersunk, I then drilled actual holes through the stop moulding to accommodate the bolts. Then I installed the moulding using the Toggler in the upper hole. 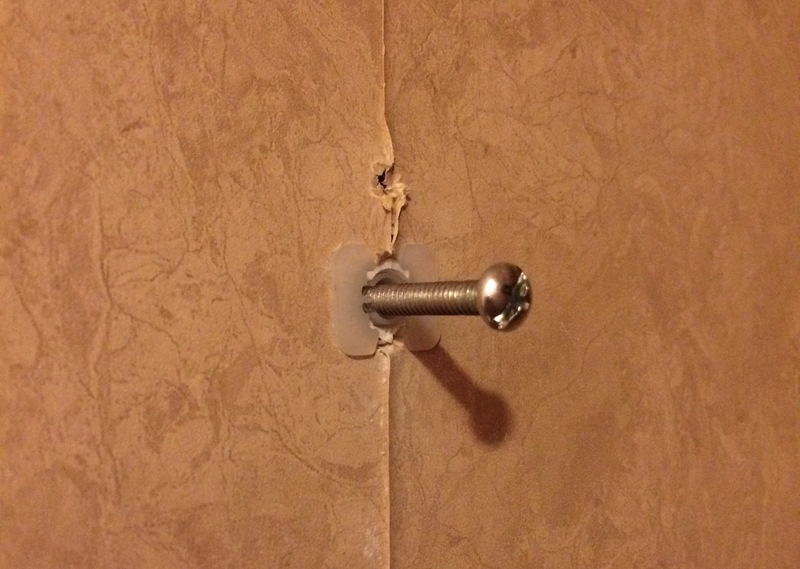 As with the Toggler, I drilled a 1/2″ hole in the wall. This one isn’t as crucial since most of the work is being done by the upper anchor, plus I want this project to stop creeping, so I’m moving fast now. It’s an optical illusion. The upper bolt is perfectly aligned with its anchor. This one was pretty easy. I found a screw that fit, I drilled a pilot hole in the moulding, and I screwed it in. I forgot: since the hook hangs from the single keyhole, and it’s impossible to tighten the screw through all the filigree, the thing swings around. A lot. Somehow, this has now become my hook, for my towel. All done but the cleanup.